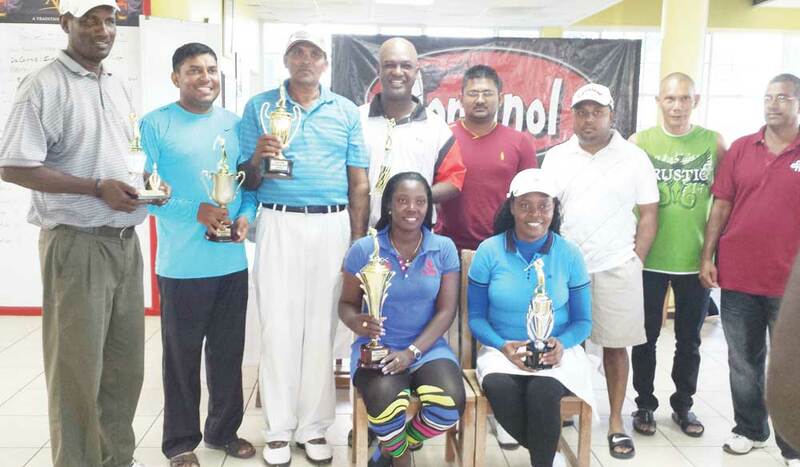 The sun blazed down on the Lusignan Golf Course, ECD but paled in comparison to the heat exuded by Shanella Webster as she carted off the spoils when the Torginol Paints Golf Tournament concluded at that venue Saturday afternoon last. Shanella Webster (seated left) revels in her victory with her competitors and other colleagues. The prolific golfer ended with net 64 and eked past Kalyan Tiwari on a count back after the latter player also finished on a similar net rate. Fazil Haniff took the third place with a net 66, while Janice Prince benefited from a countback among Vijay Deo and David Mohamed to seal off the fourth place after they were all tied on a net 67 score. Mohanlall ‘Santo’ Dinnanuth retained his good form, winning the Best Gross with 73 while the prize for the closest to the pin went to Brian Hackett. Meanwhile, Captain Chatterpaul Deo, expressed gratitude to the ground staff for the preparatory groundwork on the course. He said that the excellent scores registered by the players were as a result of the diligent preparatory work of the ground staff. Mr. Kemraj Dhanraj represented the sponsors, the Continental Group of Companies, and assisted in the presentation of prizes. He also assured the organizers that his company is pleased with the quality of the tournament and is keen to continue with the sponsorship deal next year. Vice President of the Lusignan Golf Club, David Mohamed, expressed gratitude to Torginol Paints for their benevolence while assuring his benefactor that the members always look forward to playing in the annual tournament. He said that they are eagerly awaiting next year’s edition.